Ryan Betts, Cloud Solutions Architect: Blackberry's consistently recevies an e-mail stating "Outlook Message Manager (Surname, Firstname) (KEY: 96B2A5668CD0D8438AD1D549xxxxxxxx)", although the error does not appear in Microsoft Outlook 2010/Exchange 2010. Blackberry's consistently recevies an e-mail stating "Outlook Message Manager (Surname, Firstname) (KEY: 96B2A5668CD0D8438AD1D549xxxxxxxx)", although the error does not appear in Microsoft Outlook 2010/Exchange 2010. The following Blackberry document outlines the fix for this particular issue it is related to Microsoft Exchange 2010 and is automatically ignored by Outlook clients. Although the fix is to create a filter to basically ignore the message, in this instance it cannot be done on the local Blackberry handset and must be done from inside the Blackberry Enterprise Server (BES) console. 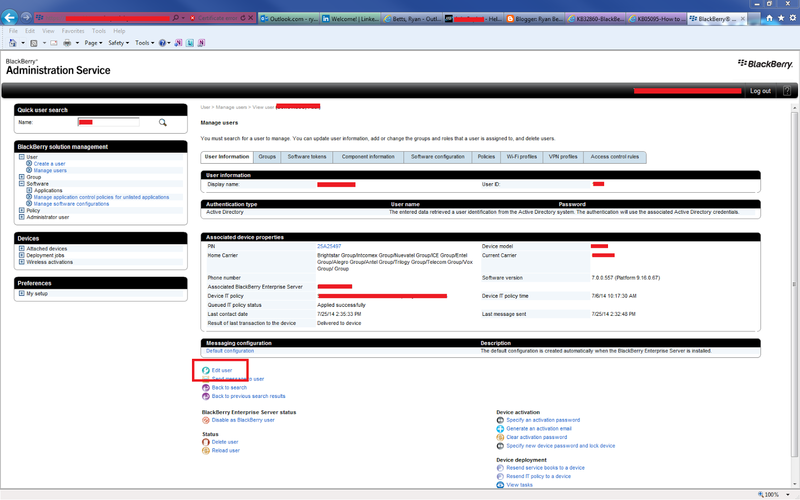 Open the Blackberry Administration Service and click Manage Users from the main landing page. Use the Display Name search field to locate the user experiencing the problem. Click on the user from list of returned results. Name the filter descriptively, and tick Body: and insert the string "Outlook Message Manager", and ensure Recipient Type is selected and Sent directly to me. You must also tick Do not forward e-mail messages to the device. Use the + icon to save the configuration. The user will no longer get the annoying message.